The sky is falling in Washington D.C. after the Redskins blew a winnable game against the St. Louis Rams. Last week I talked about savoring a nice win, not getting too far ahead of ourselves (and by that I mean the collective Redskins fans of the world) and tempering expectations based on one game. This week the sky is falling, all hell has broken loose, I’m panicking and the season is completely lost based on one game. That’s right, welcome to the sick, sick mind of Redskins fans (or this one at least). Let’s take a trip in the way-back machine to set the stage for this mindset before we get into what happened on Sunday. Skins fans of my generation, ages 23-39, were old enough to be kids during the glory days and remember the Super Bowl appearances either first hand or, for those on the younger end of that age range, from their parents. Our childhood memories and legacy of fanhood includes those three Super Bowl victories and one loss between 1982 and 1991. It includes RFK stadium, Joe Theismann, Mark Rypien, the Hogs, the Fun Bunch, Darrell Green (aka the fastestman in the NFL), Doug Williams, Riggo and of course Joe Gibbs. A huge chunk of Skins fans were born into that winning tradition. Then add in this fun little side narrative. Our beloved owner Jack Kent Cooke dies in 1997 and the team is sold to slimy businessman Daniel Snyder who outbids Cooke’s son. The Skins move from historic RFK stadium to a shiny new park in Landover, MD, 25 minutes outside of town. Snyder sells the naming rights to Jack Kent Cooke Stadium to FedEx. Snyder parades in too many high-priced,over-the-hill, washed-up players for me to list in this space. In 2005 the team makes the second round of the playoffs thanks to a stout defense and the coaching of Joe Gibbs. Two years later Gibbs would again retire, stud linebacker LaVar Arrington would leave the Skins for the Giants then retire, and safety Sean Taylor would be killed during a botched robbery in his home. Since Taylor’s death in 2007 the Redskins have finished fourth in their division every year. So back to Sunday. 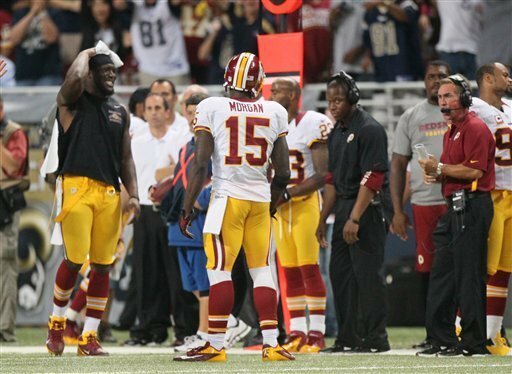 Was I surprised Josh Morgan blew theRedskins’ chance for victory with a boneheaded personal foul? Was I shocked when Shanahan called for a completely un-makeable field goal rather than attempt an offensive play with RGIII? Was I down on the floor, clutching the carpet in disbelief that we’d blown a game against the hapless Rams? I finished my beer, mumbled ‘goddammit’ under my breath a few times and walked home. I was upset. I wanted to win. But I didn’t expect to win. This wasn’t the top dog Patriots being upset by the Cardinals. Patriots fans expect to beat inferior teams. Redskins fans want to beat inferior teams. That’s the difference. The mismanagement and ineptitude of this franchise has robbed us of high expectations. It’s taken away our right to be truly excited. This team wears the same colors as the Redskins of my childhood, but that’s where the similarities end. RGIII has generated a lot of buzz around town but this game was the perfect reminder that this is still not a well built team. Josh Morgan lost his cool at the worst time. $42 million Pierre Garcon has played in one of eight quarters this season. The defensive front seven generated no pressure after Brian Orakpo went down with an injury. We found out yesterday that Orakpo is out for the season. The team’s lack of defensive depth makes an injury like that all the more devastating. Here’s the bottom line, good teams find ways to win games. On Sunday the Redskins found a creative new way to blow one. Somewhere between the fantastic Week 1 offensive outburst and the hard to watch turnstile defense of Week 2 are the real 2012 Redskins. The successes and moments of true growth are worth celebrating, but let’s just say I’m not saving any money for playoff tickets. Next week is our home opener against the Bengals. I’m not expecting much, but I would kinda like to win.